Indexed in: EMBASE, EBSCO, Ulrich's Periodicals Directory. Development of safe and effective anti-cancer drugs is one the most active areas of scientific research today and it is likely to remain so for years to come. Cancers cause more deaths than any other single disease, both in the developed and developing world. Prognosis in many forms of cancers is often glimpsed, despite major development in surgery and radiotherapy. Development of cancer chemotherapy remains an important challenge. The major bottleneck in the development of safe and effective anti-cancer drugs is the complex nature of the disease, involving still far from perfect understanding of the disease process at the molecular level, heterogeneity, and environmental factors. Emergence of resistance against existing drugs is yet another challenge to be faced. Research and development in the area of anti-cancer therapies are overwhelming. For researchers working in this field, it is often difficult to keep track of and benefit from the key developments. The eBook series, Frontiers in Anti-Cancer Drug Discovery, is intended to represent the most notable developments in the field in the form of cutting edge reviews written by the leading experts. 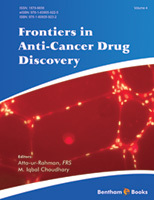 Volume 4 of the eBook series, Frontiers in Anti-Cancer Drug Discovery, is a compilation of six well written and well referenced chapters contributed by some of the most prominent researchers in the field of cancer chemotherapy. Munoz and Coveas skillfully review the role of peptide substance P (SP), and the NK-1 receptor in cancer progression, especially migration of tumor cells, angiogenesis and antiapoptotic effects. Based on this, they have discussed the relevance of NK-1 receptor antagonists in blocking the function of SP, thus serving as Intelligent Bullets against cancer. Bouattour and Wassermann have contributed a review on the understanding of the hepatocellular carcinoma (HCC) at the molecular level, and identification of targets for drug development against this orphan disease. Angiogenesis plays an important role in the progression of HCC due to the well-vascularized nature of the tumor. They review the results of pre-clinical and clinical studies on some novel agents against HCC targeting angiogenesis. Metal complexes play an important role in cancer chemotherapy. The best known example is cisplatin. However, platinum based drugs are known for severe adverse effects, lack of tolerability and emerging resistance. Oliveira Silva reviews the anticancer and antitumor activities of ruthenium based drugs against cancer. Several of these complexes have entered into clinical trials and have shown great promise. Fujii et al. have contributed a comprehensive review on the development of chemotherapy or endocrine therapy against breast cancer. The overall theme is the effectiveness of molecularly-targeted therapy. These therapies exert their effects anticancer/anti-tumor effects by targeting human epidermal growth factor receptor (HER), mammalian target of rapamycin (mTOR) and vascular endothelial growth factor (VEGF). Wu et al. review the role of intracellular signaling transduction pathways (Purinergic signaling) in cancer and associated inflammation and immune response. Recent advances in the development of purinergic modulators as cancer therapies have also been comprehensively discussed. Last but not the least, the role of HER2 (Human epidermal growth factor receptor 2) in breast cancer is extensively reviewed by ODonovan et al. HER2 is over-expressed in breast cancer, particularly in aggressive types. In the last decade, the HER2 has been a popular target for the development of breast cancer therapies. Some of these drugs, along with their mechanisms of action, limitations and effectiveness in various stages of breast and other cancers are discussed in this article. This volume of the eBook series represents the results of a considerable amount of work by many eminent contributors. We wish to thank them all for their excellent contributions and their commitment to complete the writing assignments in time. We would also like to thank the excellent team of the Bentham Science Publishers, especially Ms. Fariya Zulfiqar. The team is led by Mr. Mahmood Alam, Director Bentham Science Publishers, who deserves all appreciation.